Flame tests identify alkali metal ions in compounds. Transition metals form different coloured precipitates with sodium hydroxide solution. Gases are identified by simple tests. , such as dilute hydrochloric acid, is added to the test compound. is used to confirm that the gas is carbon dioxide. 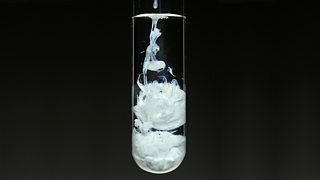 It turns from clear to milky when carbon dioxide is bubbled through. of barium sulfate forms if sulfate ions are present. The hydrochloric acid is added first to remove any carbonate ions that might be present - they would also produce a white precipitate, giving a false positive result. Barium nitrate solution can be used instead of barium chloride solution. However, nitric acid is added first to acidify the test solution. Sulfuric acid cannot be used because it contains sulfate ions - these would interfere with the second part of the test.
. Chlorine, bromine and iodine are halogens. Their ions are called halide ions, eg chloride, Cl-. One way to remember the colours is to think of ‘milk, cream, butter’ (white, cream, yellow). The nitric acid is added first to remove any carbonate ions that might be present - they would produce a white precipitate of silver carbonate, giving a false positive result for chloride ions.